Once you land in Auckland, head to the CBD and check into your accommodation. After you’ve had some time to rest you can spend the rest of the day exploring. 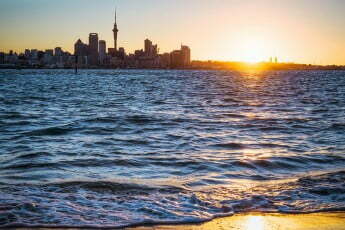 Auckland, New Zealand's largest city, is set between two harbours and has a wide range of things to see and do for the whole family. The mild temperatures in winter make it easy to get out and about and experience a vibrant city style and spectacular landscapes. Take an underwater journey through Kelly Tarlton’s SEA LIFE Aquarium, with the world's largest sub-Antarctic penguin colony on display, come face-to-face with New Zealand's largest collection of sharks. For an outdoor wildlife experience, take the kids on a dolphin and whale safari in the Hauraki Gulf. Find cool interactive displays for the kids at Auckland Museum, or trace New Zealand’s maritime history at the New Zealand Maritime Museum, with fun interactive displays. For a day out on the water, take a scenic 12 minutes ferry across to the seaside village of Devonport, on Auckland’s North Shore. Head up to North Head for Instagram-worthy views across the harbour – or experience sailing on an authentic Americas Cup Yacht. Take a flight from Auckland to Queenstown. Get your heart racing with adventure-filled holidays curated by The Ride Side and sightsee in one of the most beautiful places on earth. Nestled alongside the pristine waters of Lake Wakatipu and surrounded by snowcapped mountains, Queenstown is the perfect winter holiday destination for the whole family. Explore one of four ski fields, Coronet Peak ski area caters for all levels and is only 20 minutes’ drive from central Queenstown. Cardrona Ski Resort is only one hour from central Queenstown and offers wide open terrain for all levels. Treble Cone is the South Island’s biggest ski area and a favourite for advanced skiers and snowboarders, and The Remarkables Ski Area - Remarkables by name, remarkable by nature, with levels for everyone. Take the family to the picturesque former gold mining village of Arrowtown, charming and quirky nestled below the beautiful peaks that surround the Arrow River. Arrowtown is full of boutique cafes, restaurants, galleries and a great base for some scenic walks. The Queenstown Winter Festival occurs every June over four days. The Winter Festival has grown into the Southern Hemisphere’s biggest celebration of winter with fireworks, entertainment, live music, comedy – with lots of family fun, loved by both locals and visitors. For some non-snow related fun, head over to Wanaka, only 1hour from Queenstown and be entertained and amazed at Puzzling World. Puzzling World, offers the world’s first ‘3-D’ Maze, Psychic Challenge, amazing Illusion Rooms, Puzzle Centre/Cafe and crazy architecture. Take a flight from Queenstown to Christchurch. Take a short flight from Queenstown to Christchurch, where there are heaps of fun family activities to enjoy some quality time together. Crisp, calm blue-sky days provide the perfect conditions for skiing and snowboarding at one of the many ski fields around the region or take the family to see some New Zealand wildlife. Visit the International Antarctic Centre to get a taste of the "coolest" continent. Watch Little Blue penguins being fed, take an ice voyage with 4D effects and at selected times get up close and personal with Huskies at the Husky Zone. There's so much to see and do so best to make a day of it. Orana Wildlife Park is New Zealand's only open-range zoo. The park is huge, so it's best to make a day of it! View lions, rhino and tigers…the list goes on. An all-time favourite has to be hand feeding the giraffe. The giraffe encounter is one of the most popular attractions in the park, so be sure to check feeding times and get there early. Hanmer Springs is an hour and a half from Christchurch and is beautiful, surrounded by a mountain range. The snow often covers the ground and it’s enough to have a snowball battle or to go tobogganing. A visit to the Hot Pools afterwards is a nice experience. Sitting in the steaming hot water and watching the snowflakes melting is very relaxing. Mt Hutt ski area has wide open terrain for all ski and snowboard ability levels, and kids 10 years and under ski for free at Mt Hutt. It’s the perfect snow experience for every age and ability and fantastic for families. You can take a daily shuttle directly from Christchurch, so you don’t need to worry about parking. Take a flight from Christchurch to Rotorua. Welcome to Rotorua, New Zealand's coolest hot spot. Rotorua is one of New Zealand's true getaway destinations and a geothermal wonderland. With so many activities on offer, it is the perfect year-round destination, with activities for the whole family. Check out Rotorua's native and Redwoods Forrest. Something that’s fun for the whole family - fly through the trees on a zip line as part of Rotorua Canopy Tours. You can also hire a mountain bike and trek through the forest, with 130km of trail network there is something for every skill level. If you want a unique Kiwi experience, only 10 minutes from Rotorua city centre, you’ll find New Zealand’s See the popular Farm Show, and after the show, you can visit the Farmyard Nursery, which is home to the cutest baby animals ready for photos all year round! The Agrodome is a great winter destination, open all year round in any weather. Get right into the Māori culture, starting at Te Puia. It's a geothermal wonderland with the largest active geyser in the whole southern hemisphere. Explore Te Whakarewarewa, a 60-hectare Geothermal Valley, showcasing the famous Rotorua mud pools and over 500 geothermal wonders. Afterwards, take the kids to the Kiwi House and viewing enclosure featuring two iconic native New Zealand kiwi birds. Skyline Rotorua Gondola is the best way to take in the 180-degree views of Lake Rotorua, the city and surrounding landscapes. Once you reach the top, the kids can enjoy a ride on the luge – with three different options and over 5kms of tracks one ride is never enough. While the kids are racing you can enjoy a meal and drink at the Stratosfare Restaurant and Bar, serving local New Zealand cuisine. Take a short flight from Rotorua to Auckland, then connect on to your international flight to Singapore.